In the most significant global controversy since Brexit and a misogynistic oompaloompa being elected American President, Twitter is considering increasing the size of the space available to us to communicate. You’d think users would be happy to have a wider girth space with which to communicate online – but no. Size might matter to Twitter, but its users are all about quality over quantity. When Twitter began eleven years ago the 140-character limit was implemented because, at the time, that was character limit of a text message. Nowadays, most of its users access Twitter through its mobile app, so there’s no longer a technical constraint. 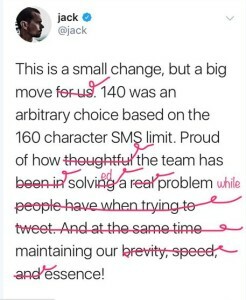 A selected sample of users had the opportunity to test out the new limit allowing them to express themselves within a 280-character limit, rather than the traditional 140. The test is only being applied to languages outside of Korean, Chinese and Japanese. Twitter has noted that in those languages, a user can express more through one character than languages such as English. The beauty of Twitter is its brevity. Facebook is saturated with soccer-mum rants; on Twitter we`re all forced to get straight to the point. Having it’s figures squashed by Facebook, Instagram and Snapchat has perhaps pushed the company to change. Its user base remained static at 328 million during the first two quarters of the year. However, the platform retains huge loyalty. Its daily user base is spending more time engaging with the platform. Except for Ed Sheeran, of course. Jack, can we get you some ice for that burn? 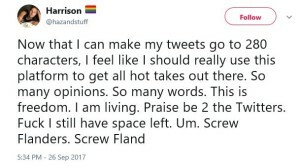 Imagine what Donald Trump could do with double the space to express himself? Twitter could do with several improvements, but doubling the character limit is not one of them. Better regulations on trolls and propaganda bots would be a start. Also, I would make a sacrifice to the Gods for an edit button.